It’s been very quiet lately. On the road at least. But now I am back, back with a Bang. I am not much of a vegetarian. I like my steak a reddish medium rare, greens only as a side, if the plate allows it. Consuming red meat inherently implies violence I am told. On the other hand, those who stick to a diet of vegetables and tofu, vegetables with tofu and vegetables over tofu are peace-loving citizens, emanating an aura of harmony and tranquility. 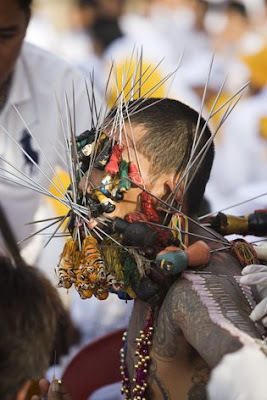 The past week saw the Thai island of Phuket celebrate the innocuously named Vegetarian Festival. The diet: lots of tofu of course, besides knives, swords, axes, sticks, needles, pins, spikes and firecrackers the size of dynamite. At times, the streets of Phuket Town resembled a war zone. 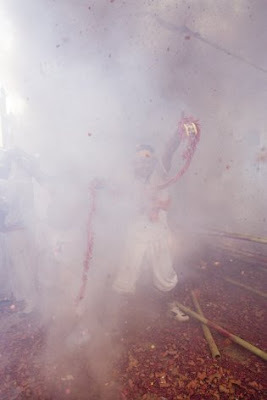 Devotees, pierced beyond recognition, shrine bearers, frantically dancing as firecrackers exploded overhead. Everyone impervious to the pain and dangers. Such are the unrecognized powers of tofu that it wont be long before the world’s armies catch on. I think I’ll stick to my cherished steak. A little pain goes a long way towards making us human.